We had fantastic customer service on our order for Sketcup P ..
Prices Exclude VAT SketchUp Pricing in Ireland from AxonWare. Get SketchUp Pro . Order Online from the leading SketchUp Discount Reseller in Dublin Ph:+353-16535178. Best place to Buy SketchUp. SketchUp Pro is the award-winning program that finally delivers a smarter way to think about 3D modeling. The new 2019 version is the best release of Sketchup yet - you won’t believe how easy it is to use. Trimble have vastly simplified the process of building and documenting 3D models. Order from AxonWare - and get your serial number right away. Start working without delay! SketchUp is a deceptively simple, amazingly powerful tool for creating, viewing, and modifying 3D ideas quickly and easily. SketchUp was developed to combine the elegance and spontaneity of pencil sketching with the speed and flexibility of todays digital media. Available in English, Français, Deutsch, Italiano, Español. 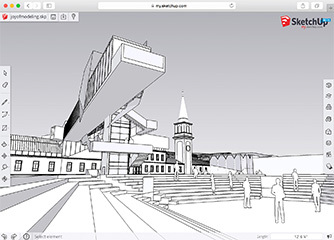 Note: SketchUp Make is a free version of SketchUp, for non-commercial use ONLY. If you are using SketchUp commercially, you will need to purchase a licence of SketchUp Pro to be compliant. From v2013 onwards subscription and support is mandatory for the first year as part of the SketchUp pricing model. There is no way around this - sorry! Developed for the conceptual stages of design, this powerful yet easy-to-learn software allows for quick and easy 3D form creation - the result is an interface that supports a dynamic, creative exploration of 3D form, material and light. SketchUp Pro combines a compact yet robust tool-set with an intelligent guidance system that streamlines the 3D drawing process. Who uses SketchUp Pro? Everyone. Hundreds of thousands of professionals in architecture, construction, engineering, commercial interiors, light construction, landscape architecture, kitchen & bath design, urban planning, game design, film & stage, woodworking and plenty of other fields use SketchUp Pro every day. It’s the sensible alternative to complicated, expensive CAD software. Many architects use Sketchup in combination with Archicad, VectorWorks and Autocad Lt.
SketchUp Pro is like a pencil with superpowers. Start by drawing lines and shapes. Push and pull surfaces to turn them into 3D forms. Stretch, copy, rotate and paint to make anything you like. More advanced? Start modeling from CAD and terrain data, photographs or even hand sketches. Build models with custom behaviors and attributes. SketchUp Pro is as simple and as powerful as you want it to be. At some point in every project, you need to produce a set of drawings that shows your model: plans, sections, elevations, perspectives. LayOut in SketchUp Pro lets you add model views to pages, choose drawing scales, adjust line weights and add dimensions, callouts and graphics. Changes to your model are reflected automatically in LayOut. When it’s time, export PDFs, images and CAD files. SketchUp is not just for 3D models. Draw plans, elevations, details, title blocks and a lot more with LayOut. When your model changes, so does your document. Simple. There’s a reason SketchUp is synonymous with friendly and forgiving 3D modeling software: we don’t sacrifice usability for the sake of functionality. With handy contextual tips, a dedicated Instructor panel for beginners, and mountains of online resources, help is always at hand. 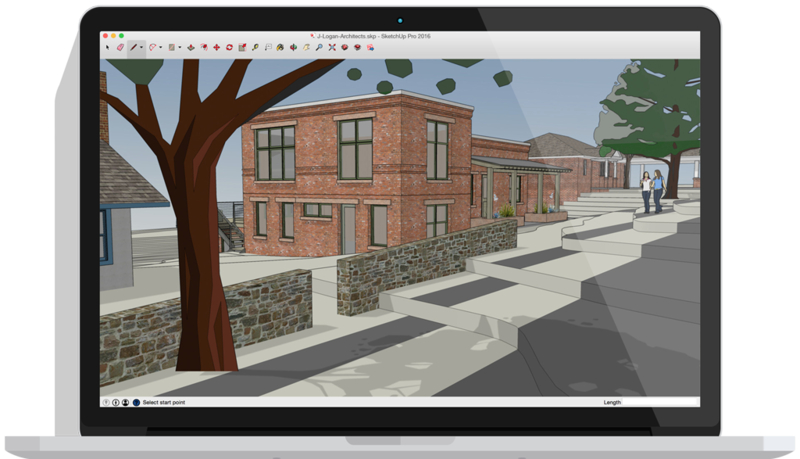 Trimble built SketchUp Pro to slide right into your existing workflow. Ready for some alphabet soup? With importers for DXF, DWG, 3DS, DAE, KMZ, TIF, JPG, PNG and a few more, you can bring in drawings, models and images to your heart’s content. 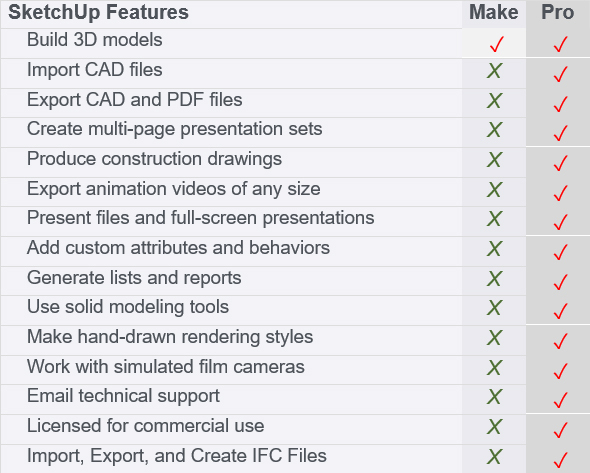 SketchUp Pro also exports all of those formats, plus PDF, OBJ, FBX, XSI, VRML, MP4, WEBM and AVI. OMG. Slides are boring. Present from SketchUp Pro. Scenes let you save views of your model to pull up anytime. Styles provide endless visual effects to make your work look precise, sketchy or anything in between. Section Planes slice through models for creating sectional views. Go fullscreen, walk around, add labels and export flyover animations. Present from SketchUp Pro and get your point across every single time. Need a particular chair for the room you’re designing? A lamp for your carriage house? A rhino for your zoo? You’ll find almost anything you need in SketchUp’s 3D Warehouse, the world’s biggest repository of free 3D models. And as for extensions that provide extra features and tools, our all-new Extension Warehouse is your ticket to add-on nirvana. Where does building information modeling begin? In SketchUp Pro, start by tagging groups and components with industry standard classification types. Then, geo-locate your model for shadow studies and site context. Continue on, further enriching components with data attributes or programming functions. Build smart spreadsheet reports, or wrap up your entire project in a tidy IFC file, ready for further modeling and analysis with the next instrument in your BIM tool box.. In about two minutes, you can choose a section of the world to bring into your SketchUp Pro model—up to a square kilometer at a time. For free, you’ll get aerial imagery, a 3D terrain model and lat-long data to produce accurate shadow studies. From there, you can import pre-modeled buildings for site context and use Google Maps Street View imagery to model anything else you need. Your mother always told you that the key to 3D modeling success was tidiness and organization. Make your models easy to work on and easy to present. Use groups and components to divvy up your geometry into logical chunks. Layers come in handy for separating big pieces of your model, and the Outliner is a way to see everything at once. Eventually, some 3D models grow up to become professional 2D drawing sets. LayOut in SketchUp Pro helps you showcase your models and create drawings you'll be proud of. LayOut is used for generating presentation documents. With LayOut, you're equipped for page design, drafting, vector illustration and slide presentations: everything you need to explain everything. After you insert a SketchUp models into a LayOut document, you can design the document to highlight your 3D model's best features. If you ever need to change or update your original SketchUp model, you can update the model in LayOut so that all the details are synched automatically. 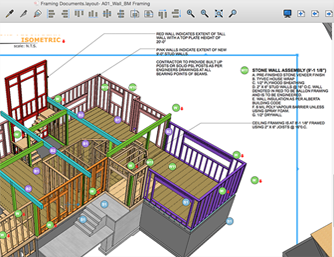 With LayOut, insert SketchUp model views wherever you want in your document. These "viewports" are living, breathing views of your project. When your model changes, all of your viewports update too. LayOut brings the feel of SketchUp into 2D space in an incomparably beautiful way. Line work, shadows, textures, text, dimensions, title blocks: all exactly the way you want. LayOut's drawing tools are just like SketchUp's: simple, smart, and fun. And everything you draw is vector smart, so scaling and rotating can be done with the utmost precision. Just like components, section planes have names and symbols, making them easy to find, organize, and edit in Outliner. Now, it's easy to access and manage sections whenever you need to. Filled Section Cuts are now baked into SketchUp Pro. Select a color for your fills via the Styles dialogue and bake them into templates. Fast Sections SketchUp features improved performance for models that use section planes to hide large amounts of geometry. The more geometry you section off, the more you’ll benefit! Need to add linework that’s not in your model? Create a scaled drawing in LayOut and sketch over a 3D model to flesh out your project. Or draw from details to scale from scratch directly in LayOut. Import a DWG into LayOut and find illustrations already scaled to paper size. Now SketchUp projects can live side by side with CAD linework and take advantage of DWG libraries everywhere. LayOut A+: plays well with others. Inferencing, chamfering and filleting, arcs, offset arrays, selections: LayOut is even better at everything you need to draw details or create beautiful illustrations at scale. SketchUp now features Advanced Attribute fields for a component’s Price, Size, URL, Type, Status, and Owner. So now it's even easier to embed projects with useful information. Generate Report now aggregates component data so you can do things like configure reports to sum parts and quantities for schedules and cutlists, or create detailed estimates by adding up prices by layer. It’s time to crunch model data! BIM works best when information moves freely between applications. You can rely on IFC in SketchUp to transfer the attributes you assign and manipulate in projects.